Can I bring my bicycle on board trains and buses? 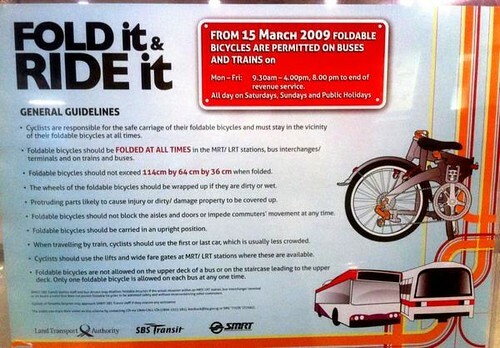 If your bicycle is foldable, you may bring it on our trains and buses. It should be folded while on board. You are responsible for its safe carriage and must not leave it unattended at any time. Your bicycle should also be folded at all times in the MRT/LRT stations, and bus interchanges/terminals. Note: Station staff and bus drivers may not allow foldable bicycles if a situation does not permit them to be admitted safely and without inconveniencing other commuters. Can I bring my foldable bicycle on board anytime? Are there specific train cars for foldable bicycles? You are encouraged to use the first or last car which is usually less crowded. How many foldable bicycles are allowed on the bus? Only one foldable bicycle is allowed at any one time. Yes, your bicycle should not exceed 114cm by 64cm by 36cm when folded. Are there guidelines on the condition of my foldable bicycle? The wheels should be wrapped up if they are dirty or wet. Protruding parts, which may cause injury or dirty/damage property, should be covered up. Where can I leave my bicycle when I’m in the train or bus? You can leave it anywhere as long as it does not block aisles and doors or make it difficult for passengers to move. To minimise use of space, carry it in an upright position. Use lifts and wide fare gates at MRT/LRT stations, where available. Do approach our station staff or Service Leader if you need help. Who can I contact to give feedback? You may contact the Land Transport Authority (LTA) at 1800-2255 582 or email feedback@lta.gov.sg. To download the brochure on foldable bicycle guidelines, click here. To view the Rapid Transit Systems (Amendment) Regulations for foldable bicycle, click here. Hi! Is there any group initiative among local cyclist to get SMRT to allow foldable bikes on trains before 7:30am or 7am on weekdays? This would still avoid peak hour congestion, but allow early bird cyclist to take their bike on board. I agree with Mark. There should be permission for foldable bikes to go on before 7/7:30am. I agree with Mark. There should be permission for foldable bikes to go on the train before 7/7:30am. There should be a section in the train restricted to cyclists and those with luggages, skateboard etc to board. With an all day boarding year round more will invest in portable form of transport. It also encourages healthy lifestyle too. Public parks and attractions will gain higher traffic. Yes, I agree, on MRT and BUS there are many spaces before 7am. We should let LTA heard our opinions so to make it happen. I agree too that we should petition SMRT to allow foldables into the first and last carriages before 6.30am on weekdays and leave by 7.30am. There are not many lines more than an hour long. My friends and I are retirees living in various parts of Singapore and would like to ride together at different parks and park connectors early on weekdays. As it is now, we have difficulty meeting. Has anyone petition them? Utter joy - cycling the streets of KL! NUS road sign says, "Give way to cyclists"